Final post up on NG and goodbye from the Azores! Greetings from my last day in the Azores – it’s been an incredibly fast six-plus weeks since I arrived from Tuscany. I had a wonderful gathering tonight with old and new friends here to say goodbye, which was a beautiful way to end my time here. I definitely couldn’t have accomplished what I was able to in the end without the help of people here, and it was wonderful to have so many of them gathered around the same table. While I’d like to write more about what this past week has held for me, I’m going to leave you now (as it’s 1a.m. and I need to be at the airport at 10…) with my final post that went up on National Geographic’s Explorer’s Journal today. Unless there’s free wi-fi in one of the Azorean airports tomorrow, my next contact will be from Boston! It’s been a fantastic time here and I just want to give a truly heartfelt thanks to all who’ve been involved for their support. More to come soon…! 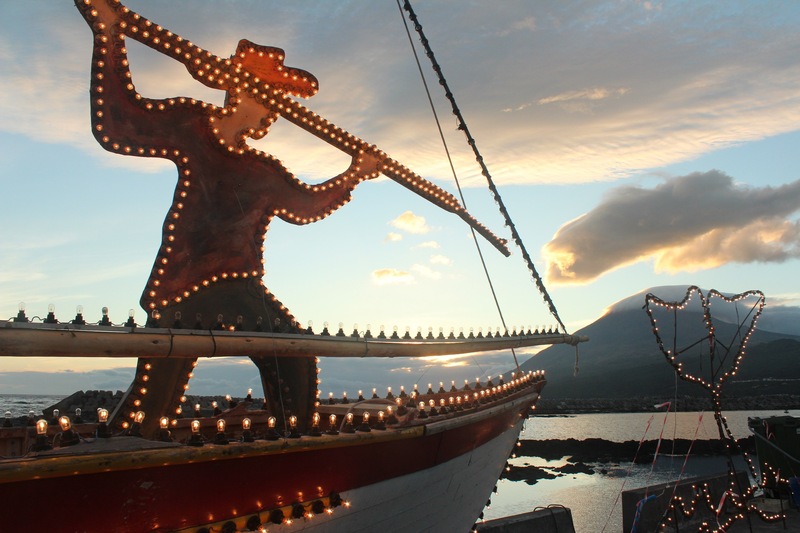 A wooden harpooner stands poised in the bow of an old whaling boat during the Semana dos Baleeiros festivities in Lajes do Pico. Photo by Gemina Garland-Lewis. My most recent post just went live on NG’s Explorer’s Journal site. Check it out for more stories! The days are dwindling for me – only five more! Today is the first day of orientation for my graduate school program – hard to imagine myself in Massachusetts right now but I better start getting used to the idea…. Hope to have more for you soon! 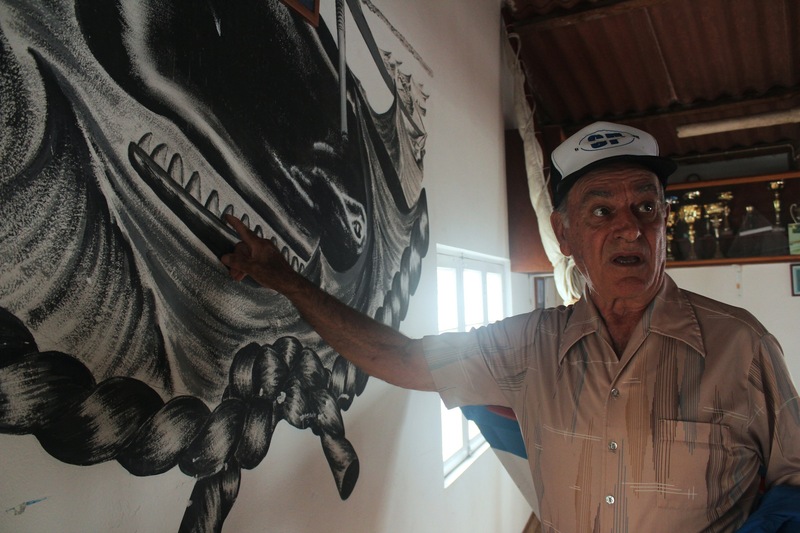 Francisco Xavier Simas, age 83, shows me the painting inside the whaleboat house in his village of Ribeiras on Pico. While not based off of any particular story, the depiction of the whale breaking a boat was well within the realm of truth. Photo by Gemina Garland-Lewis. what an inspiring story… not. Serves him right. And good on the whale for taking the time to teach the idiots a lesson. I am really surprised at the portrayal of José “Silvino” do Silveira Jorge as some kind of hero. As a story, yes it is amazing but my sympathys are with the whale. I’d like to take this opportunity to clear up a couple myths about whaling in general and my actual feelings about the topic, given that I steer clear of it in my posts to avoid any bias. I don’t expect that the people who are making these comments are the same people who will read this post, so my main hope is that all you lovely good-natured people out there might learn a little bit more about a topic that unfortunately has a lot of misunderstanding surrounding it. 1). Whaling is illegal. False. This is something you hear thrown around a lot among whale conservationists and organizations like Sea Shepherd. I even catch myself saying “when whaling was outlawed” sometimes because it’s so engrained in the way that we as people who grew up with “Save the Whales” think. The International Whaling Commission (IWC) is an intergovernmental and international organization created to effectively manage whaling and is comprised of many member countries. In 1986 a global moratorium was passed on commercial whaling, due to highly depleted stocks among the most targeted of whale species. Countries that agreed to the moratorium are bound to it, countries that lodged objections are not. Let me repeat: if you are not a member of the IWC or lodge an objection to a resolution, you are not bound to it. There is no illegality involved (which doesn’t mean all IWC member countries are happy about countries that still whale, however). Since the moratorium applied to commercial whaling only, aboriginal subsistence whaling and scientific permit whaling are still on the table – America and several other countries use the former, Japan uses the latter. 2). Japan says they’re whaling for research but the meat just “somehow” appears on the market. In the IWC’s Article VIII on Scientific Permit whaling, it stipulates: “Any whales taken under these special permits shall so far as practicable be processed and the proceeds shall be dealt with in accordance with directions issued by the Government by which the permit was granted.” This means Japan, as the government by which the permit is granted, has say over how to “so far as practicable” process these whales and the proceeds from them. Let’s get something straight here, after living in Japan and working on this topic, I’m not condoning what they’re doing. Setting a quota for fin whales, which are an endangered species, is a pretty cruel move. There’s a lot of secrecy involved in their whaling, but the point here is simply that they’re taking advantage of a bad system. 4). All whales are endangered. Again, one of these ideas I’m not really sure where it’s basis is. No doubt that commercial whaling (particularly during the factory ship days in the 1950s) devastated many whale populations in, but that doesn’t mean we can paint all of them with the same color. Check out the IUCN Red List for more information. There are times when I’m writing down all of these stories I’m collecting and stop to think: why do I spend much time thinking about whales dying? I don’t like thinking about what happened any more than the next person who grew up loving whales, but I know these men are the last of their kind and have incredible stories of a culture that will be lost with them in the coming years. My own beliefs lie in non-violence, meaning I’d no sooner want to kill a whale then wish death upon the man killing it. And while there is a part of me that still cries “you go whale!” when I hear a story of a whale escaping, at the same time I know that these men were not in this industry because they loved killing whales, but because it was what was they had to do to survive. There’s wasn’t a whole lot of opportunity to be picky with your career choice on little islands far away from everywhere else, and a lot of whalers left their work when tuna fishing became a more prominent industry. My goal is merely to show that these men are human, driven by forces that affect all of us. Those of us who deride them are fortunate to have been privileged enough to include moral factors in choosing our line of work. Today a good number of us grow up dreaming about what we want to do instead of being faced with with the reality of what we need to do to survive, which is a great blessing. Sorry there weren’t more pictures, but I didn’t really have anything that fit the ticket. 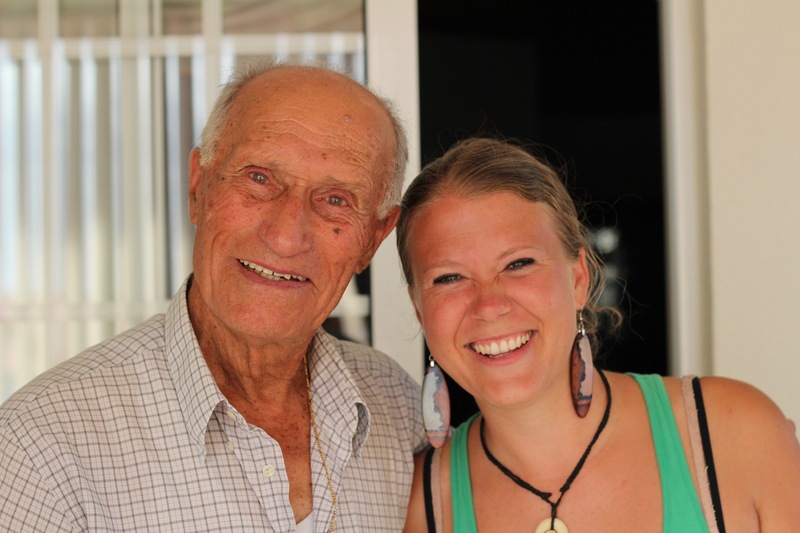 Here’s me with the cutest old whaler ever from an interview in Calheta de Nesquim on Pico this week. He’s 96 and we have matching glasses! I could barely contain myself interviewing this man. He was just too adorable. My latest post went live on Nat Geo’s site a couple days ago. Enjoy! I’ve just come back from three days on Pico island and now have another ten interviews under my belt – more to come soon! 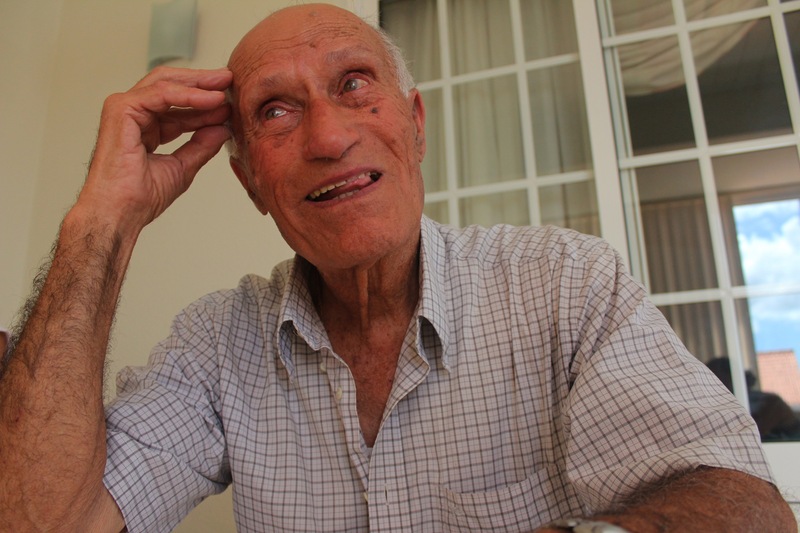 Francisco “Barbeiro” Joaquim Machado, age 92, whaled for over 50 years and was the official in the whaleboat that killed the last whale in the Azores on November 14, 1987 – three years after whaling had officially ended on the islands. Photo by Gemina Garland-Lewis. 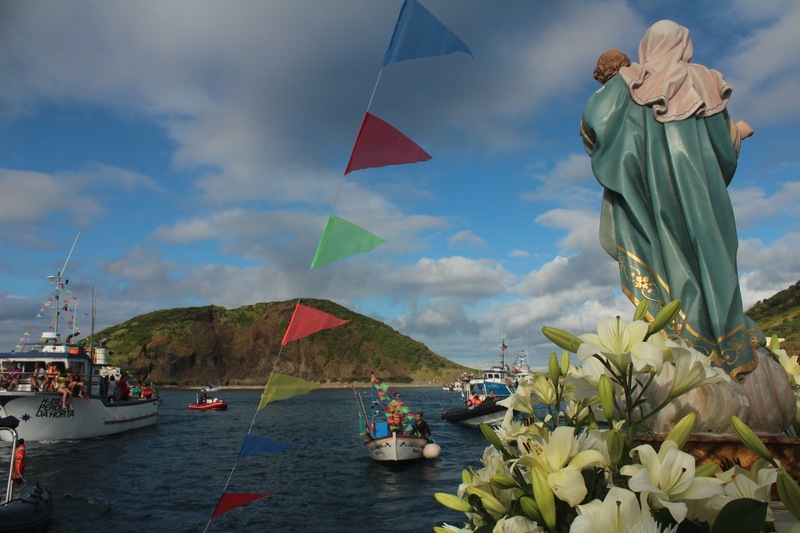 It’s been quite the roller coaster since I last wrote – this past week was Semana do Mar (Sea Week), the biggest celebration on the island of Faial. Lots of happenings, both related to work and related to fun. I’ve walked in the procession for Senhora da Guia, patron saint of whalers, interviewed a 92 year old whaler who was the official on the whaleboat that killed the last whale in the Azores in 1987, heard whaling stories mixed with love stories, and had one of the most interesting conversations yet with a man who told me his least favorite part of whaling was that they had to kill whales. For now, however, I’d like to touch on some of the more personal notes of my time here. I was fortunate enough to be able to accompany the statue of Senhora da Guia, patron saint of whalers, on the boat that carried her after she was brought down from her church atop Monte da Guia. Photo by Gemina Garland-Lewis. I’ve been out of the country for a month and a half now, and gone from my home in Seattle for two. For me, this is just a drop in the bucket of how long I’ve been away in the past. I’m realizing now that circumstances, intention, and expectations make for very different perceptions of time. I’ve had the unique privilege to come back to a country I experienced during my Watson, under very similar circumstances project-wise but very different circumstances expectation-wise. Four years ago I was here from July 16 to September 6th – this time I am here from July 13 to August 28th, meaning I’m here for the same festivals and events as last time. I am afforded the opportunity in so many moments to look around myself and know that I was standing in the same place four years ago, bringing with it a stark understanding of how different things are for me now. 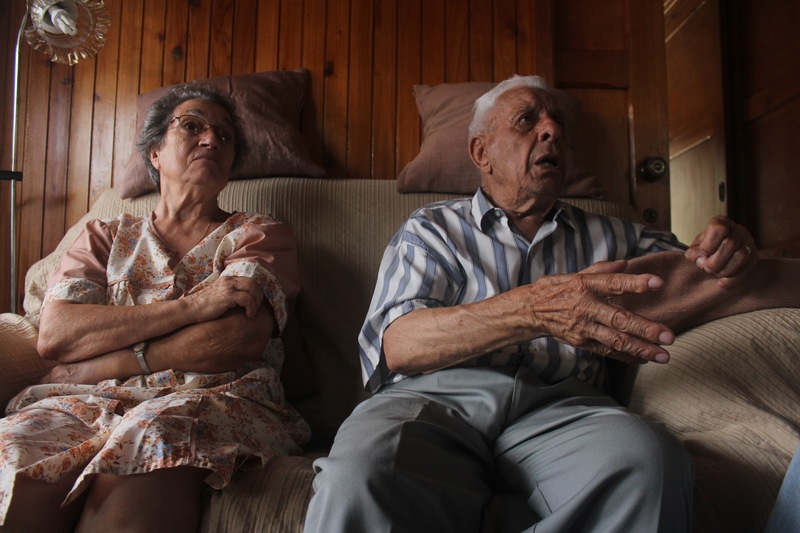 Cidalia Maria Silveira da Silva and her husband Francisco Soares da Silva tell me stories of the whaling life and how they met and married. Photo by Gemina Garland-Lewis. I am not just out of college. I am not on a fellowship whose main purpose is for me to experience the world on my own time and in my own way. I used to write every day in my journal, now my writing has been solely for grant-related pieces. My priority is not myself, but my project, which is a huge distinction. I used to spend a lot more time alone, which was both a good and bad thing. I am now surrounded by people who have done so much to help my with my project, making the work I do here infinitely more streamlined and possible. My work with the whalers is richer now than it ever could have been during the Watson, and I feel the most joy in my life here when I am speaking with these men. 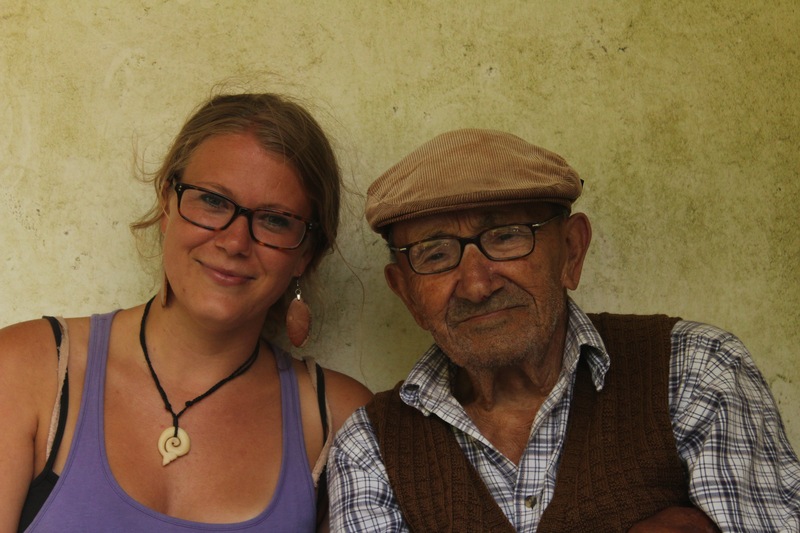 Francisco “Barbeiro” Joaquim Machado, age 92, a whaler from 1935 to the last whale killed in 1987. Not many men who have that many years in whaling – a real honor to speak with him. Photo by Rui Preito. Part of what I’m getting used to is that knowledge of my existence is preceding people actually meeting me. I’m starting to meet people who, when we start talking about why I’m on the island, say “oh yeah, I heard about you!” which is both exciting and unnerving to learn. National Geographic’s name is carrying me places that I’d like to believe people would offer without it, but I’m not so sure all the time. It also makes me consider the way in which I conduct my interactions here in a way that the Watson didn’t. As an American, I feel like if people see me acting “unprofessionally” (I use this term very loosely) that it will somehow reflect badly on National Geographic as an institution. I feel like I am the face of NG to everyone here, but what I then consider is that, as Portuguese, people here are probably more apt to think badly about me if they didn’t see me having some wine and relaxing every once and a while. 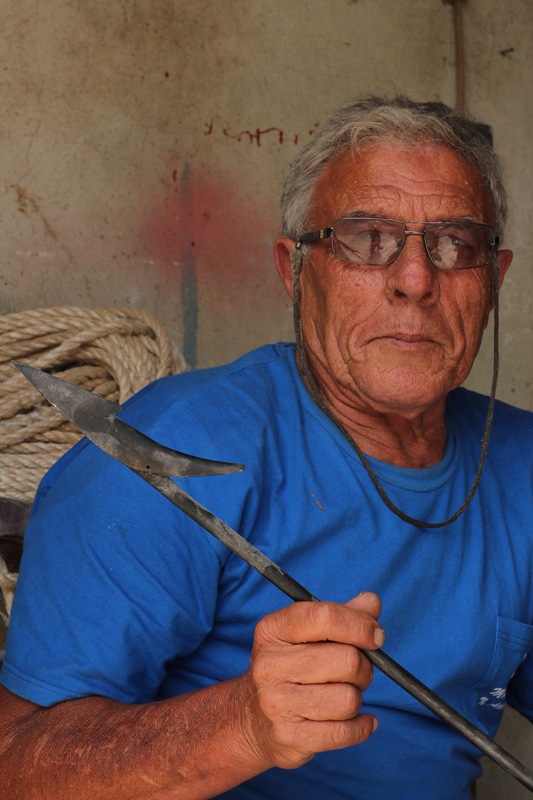 Manuel Homem, age 77, holds a harpoon head in the whaleboat workshop of João Tavares where he works in Ribeiras, Pico. One of the most interesting men I’ve spoken to yet, with the greatest compassion for whales I’ve encountered. Photo by Gemina Garland-Lewis. Also, I miss food. A lot. And good beer. A lot. I’m realizing that during my Watson, fresh out of college, I was more open to adapting to various lifestyles (and diets). Something I remember writing in my last quarterly report (or maybe my final…) was that the Watson helped me learn which things for me are open to compromise or not. It afforded me the chance to hear myself in a way that no other piece of my life has, and I’ve taken that with me and let it settle in over the last three years. I became more flexible in some ways and less in others. I learned about the type of person I want to be and the ways in which I want to live my life, which leaves me wondering now if travel can be the same when you feel rooted in who you are. 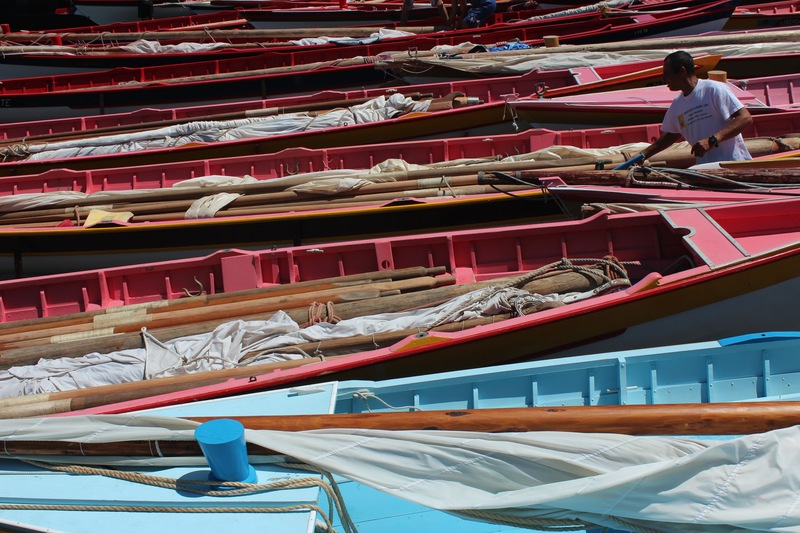 Whaleboats line up end to end in the harbor in Horta before the Semana do Mar regatta starts. Photo by Gemina Garland-Lewis. I’ve been in the Azores for one month and have just over two weeks left. They are going to be full, with some very long days coming up! I’ve finally started making trips to Pico island, where a lot of the whalers are and where I’ll be basing myself out of for part of this upcoming week. I’ve had 17 interviews so far and this week should bump that number up quite a bit! 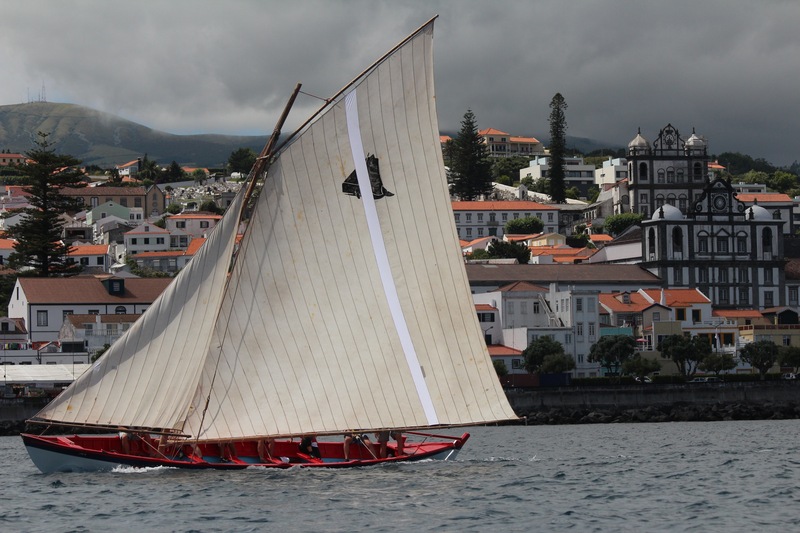 A boat from Pico sails in to second place in the sailing regatta, with the city of Horta as a backdrop. Photo by Gemina Garland-Lewis. Thanks to all who’ve been following my work here – I really appreciate your interest and support. I’ll be writing a new post for Nat Geo tomorrow (usually takes a few days to go up) so there will be more whaler-related stuff in there. If you haven’t checked out my most recent one about the man who survived being pulled underwater in a sperm whale’s mouth, you should! Amazing story. 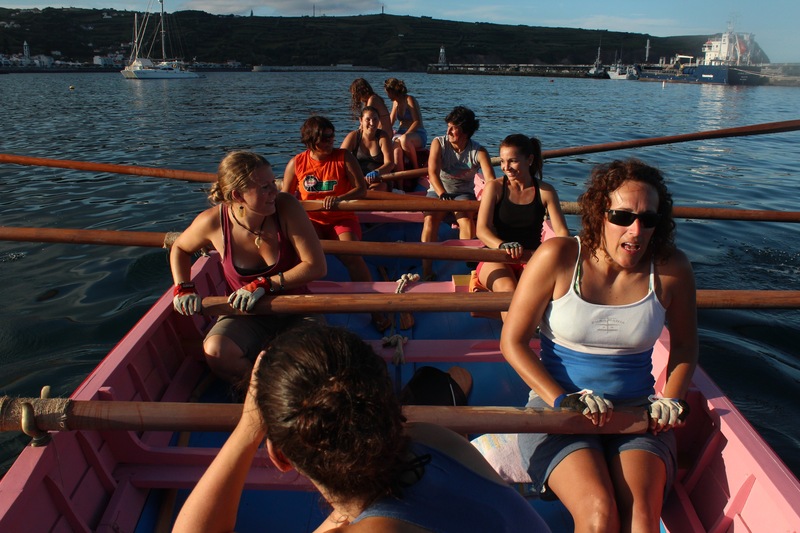 For now I’ll leave you with a view of Pico from a few nights ago and a shot of me getting put in my place with the women’s rowing team – enjoy! Até logo! 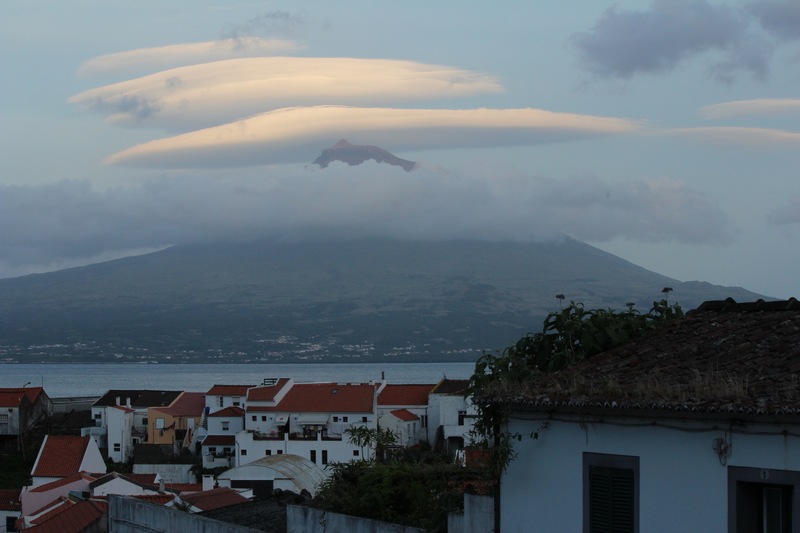 Fun clouds over Pico island, as seen from my house across the channel on Faial. Photo by Gemina Garland-Lewis. The women put me to work with a little rowing practice in the whaleboats. Those oars are wicked heavy. My latest post just went live on Nat Geo’s site – make sure to tune in to this one, it’s one hell of a story! 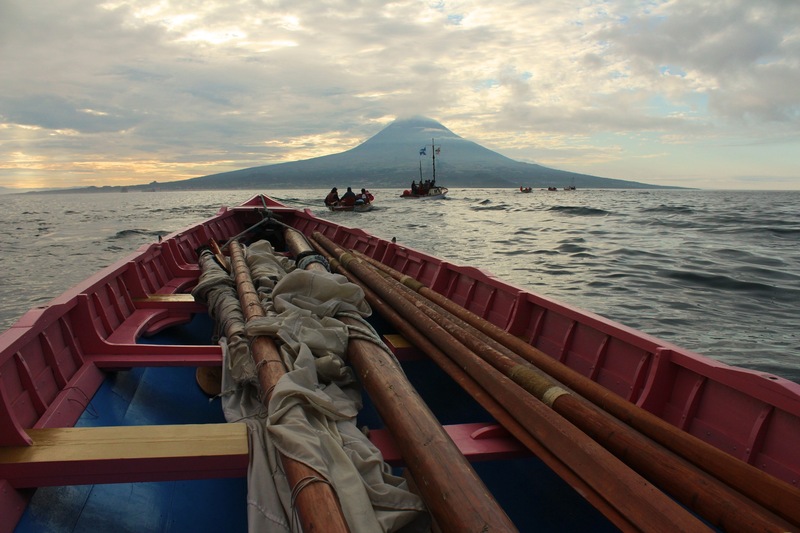 I sit in the whaleboat Senhora da Guia in the early morning sun on my way to São Mateus, Pico, for a whaleboat regatta. A motor launch tows us and the other boats, just like in the whaling days. Photo by Gemina Garland-Lewis. 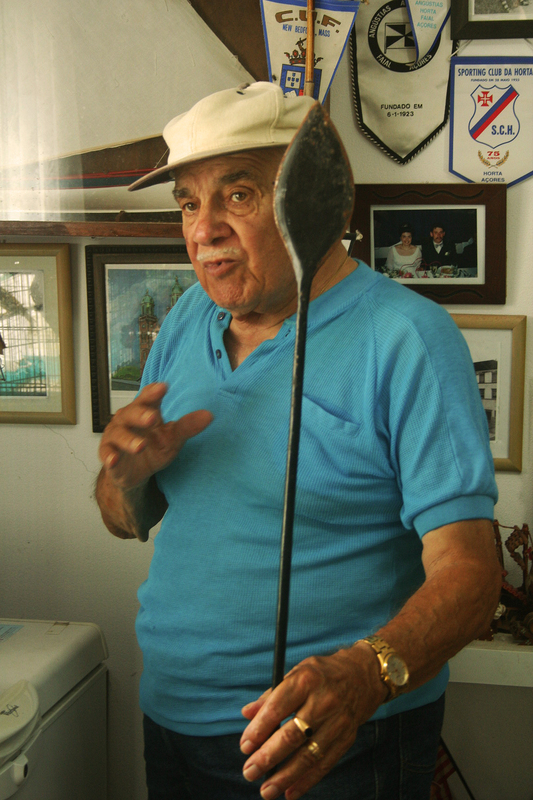 José Luís Garcia shows me his lance at his home as he recalls the stories of whaling – “the best time of his life.” Photo by Gemina Garland-Lewis, 2008.